because you who want the truth will not acknowledge it. because the truth you hope for doesn’t exist. Once again, the poem starting off this series hints that this Frederica is behind what is going on in the story, but that she feels bad for the people. What is going on? Good question. Last volume, Keiichi Maebara, a newly transferred teenager to the sleepy mountain village of Hinamizawa, beat his two friends, Rena and Mion, to death when they become demons trying to inject him with a syringe. Shortly after, he died by clawing out his own throat trying to get the truth out. How does this volume start? Back at the beginning. Keiichi Maebara just moved to Hinamizawa three weeks ago. He’s made friends with some of the local girls: Rena, Satako, Rika, and Mion. They play games. Have fun. They are close-knit so fast. It plays out so similar to how the story began. Except this time, while playing a game at store in the nearby town, Keiichi makes a fateful choice. He gives a doll to Rena, thinking the tomboy Mion doesn’t like girly things. That off-handed comment set in a chain of events that leads to a different story than last time. Soon Keiichi meets “Shion,” a girl claiming to be Mion’s twin sister but is a girlier version of her. Suspecting Mion is pretending to be someone else to act more like a girl, he plays along with it, enchanted by her beauty. Other than that, things are playing out the same. The Cotton Drifting Festival approaches and Keiichi learns about the annual murder/disappearance, known as Oyashiro’s Curse. One person is killed, and the other is demoned away. As a glowing dread builds, Keiichi and his friends look forward to the festival with “Shion” eager to join the fun. After the end of the last arc, I had so many questions. Where would it go? Would it follow new characters, or would it track one of the survivors as they struggled to uncover what happened to Keiichi, Mion, and Rena. What I didn’t expect was for everything to reset. The summer of 1983 in Hinamizawa is playing groundhogs day. Keiichi and his friends have no idea that it’s going on. But there are differences playing out. How will that effect it? What is causing it to happen? Is it part of Oyashiro’s Curse? Or is something else at play. The questions are dancing in your mind. A mystery is begging for answers, driving you to keep following the story to find out what is going on. That is the beauty of Higurashi. Even better, as the story unfolds, it’s clear that the creator thought of these questions. He had answers for them when he created it. This isn’t an empty mystery box, but a story with substance. So just keep with it and know that answers will come, eventually. And until then, speculate away and try to figure out what is going on. 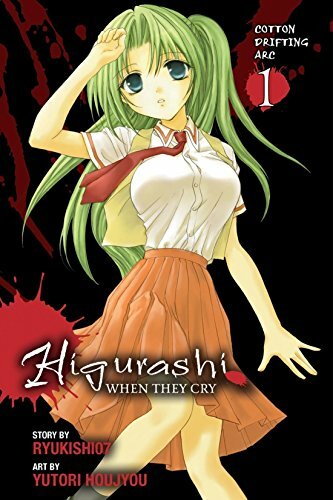 You can buy Higurashi Cotton Drifting Arc 1 from Amazon.